This document contains the Standard Code of Rules developed by The Football Association for Mini Soccer and Youth Football Competitions (the "Standard Code"). The Standard Code is mandatory for all Mini Soccer and Youth Football Competitions. Competitions seeking sanction must draft their Rules in conformity with the Standard Code, using the same numbering and standard headings. The mandatory rules are printed in normal text and the optional rules in italics. It should be noted that in many cases rules are so printed because they are alternatives and the procedure to apply should be retained and the others omitted. In all cases where a [ ] is shown the necessary name, address, number or wording to complete that rule must be inserted. Competitions may add to the core of the Standard Code, which is mandatory, providing the additions are approved by the Sanctioning Authority and do not conflict with the mandatory rules or any relevant principles and policies established by The FA. Guidance from the Sanctioning Authority should be sought in advance if there is any doubt as to the acceptability of additional rules. "Affiliated Association" means an Association accorded the status of an Affiliated Association under the rules of The FA. "AGM" shall mean the annual general meeting held in accordance with the constitution of the Competition. "Club" means a club for the time being in membership of the Competition. "Competition Match" means any match played or to be played under the jurisdiction of the Competition. "Contract Player" means any Player (other than a Player on a Scholarship) who is eligible to play under a written contract of employment with a Club. "Deposit" means a sum of money deposited with the Competition as part of the requirements of membership of the Competition. "Fees Tariff" means a list of fees approved by the Clubs at a general meeting to be levied by the Management Committee for any matters for which fees are payable under the Rules, as set out at Schedule A. "Fines Tariff" means a list of fines approved by the Clubs at a general meeting to be levied by the Management Committee for any breach of the Rules, as set out at Schedule A. "Ground" means the ground on which the Club's Team(s) plays its Competition Matches. "Management Committee" means in the case of a Competition which is an unincorporated association, the management committee elected to manage the running of the Competition and where the Competition is incorporated it means the Board of Directors appointed in accordance with the articles of association of that company. "Match Officials" means the referee, the assistant referees and any fourth official appointed to a Competition Match. "Mini Soccer" means those participating at ages under 7s to under 10s. "Non Contract Player" means any Player (other than a Player on a Scholarship) who is eligible to play for a Club but has not entered into a written contract of employment. "Officer" means an individual who is appointed or elected to a position in a Club or Competition which requires that individual to make day to day decisions. "Participant" shall have the same meaning as set out in the rules of The FA from time to time. "Player" means any Contract Player, Non Contract Player or other player who plays or who is eligible to play for a Club. "Playing Season" means the period between the date on which the first competitive fixture in the Competition is played each year until the date on which the last competitive fixture in the Competition is played. "Rules" means these rules under which the Competition is administered. "Sanctioning Authority" means [The FA] [The Lincolnshire County Football Association Limited]. "Scholarship" means a Scholarship as set out in Rule C 3 (a) (i) of the rules of The FA. "Season" means the period of time between an AGM and the subsequent AGM. "Secretary" means such person or persons appointed or elected to carry out the administration of the Competition. "SGM" means a special general meeting held in accordance with the constitution of the Competition. "Team" means a team affiliated to a Club, including where a Club provides more than one team in the Competition in accordance with the Rules. "The FA" means The Football Association Limited. "WGS" means the Whole Game System and the procedures for the operation thereof as determined by The FA from time to time. "written" or "in writing" means the representation or reproduction of words or symbols or other information in a visible form by any method or combination of methods, whether sent or supplied in electronic form or otherwise. "Youth Football" means those participating at ages under 11s to under 18s. (A) The Competition will be known as [JACK KALSON SATURDAY & SUNDAY LEAGUES] The Clubs participating in the Competition must be members of the Competition. A Club which ceases to exist or which ceases to be entitled to play in the Competition for any reason whatsoever shall thereupon automatically cease to be a member of the Competition. (B) This Competition shall consist of not more than  Clubs approved by the Sanctioning Authority. (C) The geographical area covered by the Competition membership shall be 16 mile radius from Scunthorpe Church (formally St. Johns Church now 20-20 Visual Arts Centre. (F) The Rules are taken from the Standard Code of Rules for Youth Competitions (the "Standard Code") determined by The FA from time to time. In the event of any omissions from the Standard Code then the requirements of the Standard Code shall be deemed to apply to the Competition. This Competition shall apply annually for sanction to the Sanctioning Authority and the constituent Teams of Clubs may be grouped in divisions, each not exceeding  in number. (I) Clubs must comply with the provisions of any initiatives of The FA which are adopted by the Competition including, but not limited to, Charter Standard and RESPECT programmes. Failure to comply with this Rule will result in a fine in accordance with the Fines Tariff. (K) Clubs shall not enter any of their Teams playing at a particular age group in the Competition in any other competition (with the exception of FA and County FA Competitions) except with the written consent of the Management Committee. Failure to comply with this Rule will result in a fine in accordance with the Fines Tariff. 4. (A) Applications by Clubs for admission to the Competition or the entry of an additional Team(s) from the same Club must be made in writing to the Secretary and must be accompanied by an entry fee and deposit [£15] per Team as set out in the Fees Tariff, which shall be returned in the event of non-election. At the discretion of the voting members present applications, of which due notice has been given, may be received at the AGM or a SGM or on a date agreed by the Management Committee. (B) The annual subscription [£10] shall be payable in accordance with the Fees Tariff per Club (or per Team where a Club has more than one Team in membership of the Competition) and shall be payable on or before AGM in each year. (D) A Club shall not participate in this Competition until the entry fee annual subscription and Deposit (if required) have been paid. (E) If requested by the Competition, Clubs must advise annually to the Secretary in writing by Fixture Meeting of its Sanctioning Authority affiliation number for the forthcoming Playing Season. Clubs must advise the Secretary in writing, or on the prescribed form, of details of its headquarters, its Officers and any other information required by the Competition. Failure to comply with this Rule will result in a fine in accordance with the Fines Tariff. 5. (A) The Management Committee shall comprise the Officers of the Competition and  members who shall all be elected at the AGM. (B) Retiring Officers shall be eligible to become candidates for re-election without nomination provided that the Officer notifies the Secretary in writing not later than [1st June] in each year. All other candidates for election as Officers of the Competition or members of the Management Committee shall be nominated to the Secretary in writing, signed by the secretaries of two Clubs, not later than [1st June] in each year. Names of the candidates for election shall be circulated with the notice of the AGM. In the event of there being no nomination in accordance with the foregoing for any office, nominations may be received at the AGM. (E) All communications received from Clubs must be conducted through their Officers and sent to the Secretary. The maximum fine permitted for any breach of a Rule is £100 and, when setting any fine, the Management Committee must ensure that the penalty is proportional to the offence, taking into account any mitigating circumstances. All breaches of the Laws of the Game or the Rules and Regulations of The FA shall be dealt with in accordance with FA Rules by the appropriate Association. (F) [50 %] of its members shall constitute a quorum for the transaction of business by the Management Committee or any sub-committee thereof. (I) Subject to a Club's right of appeal in accordance with Rule 7 below, all fines and charges must be paid within 14 days of the date of notification of the decision. Any Club failing to do so will be fined (in accordance with the Fines Tariff). Further failure to pay the fine including the additional fine within a further 14 days will result in fixtures being withdrawn until such time as the outstanding fines are paid. (L) The business of the Competition as determined by the Management Committee may be transacted by electronic mail or facsimile, and will not be conducted any later than 9pm on any Day. (M) The business of the Competition shall not be conducted after 9;00 pm on any Day. (B) Except in cases where the Management Committee decide that there are special circumstances, protests and complaints (which must contain full particulars of the grounds upon which they are founded) must be lodged with the Secretary within [5 ] days (excluding Sundays) of the Competition Match or occurrence to which they refer. A protest or complaint shall not be withdrawn except by permission of the Management Committee. A member of the Management Committee who is a member of any Club involved shall not be present (except as a witness or representative of his Club) when such protest or complaint is being determined. (i) All parties must have received  days' notice of the hearing should they be instructed to attend. (ii) Should a Club elect to state its case in person then it should forward a deposit of [£10] and indicate such when forwarding the written response. (viii) Fix the date for the commencement of the Playing Season applicable to the Competition. (B) A copy of the duly audited balance sheet, statement of accounts and agenda shall be forwarded to each Club at least 14 days prior to the meeting together with any proposed Rule changes. (D) Each Club shall be empowered to send two delegates to an AGM. Each Club shall be entitled to one vote only. 14 days' notice shall be given of any AGM. At least seven (7) days' notice shall be given of a meeting under this Rule, together with an agenda of the business to be transacted at such meeting. "We, (A), (name) [ ] of (address) [ ] (Chairman)/Director and (B) (name) [ ] of (address) [ ] (Secretary/Director) of [ ] Football Club (Limited) have been provided with a copy of the Rules and Regulations of the [ ] Competition and do hereby agree for and on behalf of the said Club, if elected or accepted into membership, to conform to those Rules and Regulations and to accept, abide by and implement the decisions of the Management Committee of the Competition, subject to the right of appeal in accordance with Rule 7." Any alteration of the chairman and /or secretary of the Club on the above agreement must be notified to the Lincs County Football Association(s) to which the Club is affiliated and to the Secretary. 11. (A) Any Club intending, or having a provisional intention, to withdraw a Team from the Competition must do so at least  days before the AGM. This does not apply to a Club moving in accordance with Rule 22(B). Failure to comply with this Rule will result in a fine in accordance with the Fines Tariff. (B) The Management Committee shall have the discretion to deal with a Team being unable to start or complete its fixtures for a Playing Season, including but not limited to, issuing a fine in accordance with the Fines Tariff. 12. (A) At the AGM or SGM called for the purpose in accordance with the provisions of Rule 9, notice of motion having been duly circulated on the agenda by direction of the Management Committee, the accredited delegates present shall have the power to: (i) remove a member of the Management Committee from office, (ii) exclude any Club or Team from membership, both of which must be supported by more than two-thirds (2/3) of those present and voting. Voting on this point shall be conducted by ballot. A member of the Management Committee or Club which is the subject of the vote being taken shall be excluded from voting. (B) At the AGM, or at a SGM called for the purpose in accordance with the provisions of Rule 9, the accredited delegates present shall have the power to exclude from further participation in the Competition any Club or Team whose conduct has, in their opinion, been undesirable, which must be supported by more than two-thirds (2/3) of those present and voting. Voting on this point shall be conducted by ballot. A Club whose conduct is the subject of the vote being taken shall be excluded from voting. (C) Any Officer or member of a Club proved guilty of either a breach of Rule, other than field offences, or of inducing or attempting to induce a Player or Players of another Club in the Competition to join them shall be liable to such penalty as a General Meeting or Management Committee may decide, and their Club shall also be liable to expulsion in accordance with the provisions of clauses (A) and/or (B) of this Rule. "We A [name] and B [name], the Chairman and Secretary of [ ] FC (Limited), members of and representing the Club, having been declared winners of [ ] cup or trophy, and it having been delivered to us by the Competition, do hereby on behalf of the Club jointly and severally agree to return the cup or trophy to the Competition Secretary on or before [ ]. If the cup or trophy is lost or damaged whilst under our care we agree to refund to the Competition the amount of its current value or the cost of its thorough repair." Notice of proposed alterations to be considered at the AGM shall be submitted to the Secretary by 1st May in each year. The proposals, together with any proposals by the Management Committee, shall be circulated to the Clubs by 14th May and any amendments thereto shall be submitted to the Secretary by 29th May. The proposals and proposed amendments thereto shall be circulated to Clubs with the notice of the AGM. A proposal to change a Rule shall be carried if a majority of those present, entitled to vote and voting are in favour. (B) All expenditure in excess of £300 shall be approved by the Management Committee. Cheques shall be signed by at least two Officers nominated by the Management Committee. (C) The financial year of the Competition will end on 30th April. (D) The books, or a certified balance sheet, of a Competition shall be prepared and shall be audited annually by a suitably qualified person(s) who shall be appointed at the AGM. (B) All Clubs must have valid personal accident cover for all Players registered with them from time to time. The Players' personal accident insurance cover must be in place prior to the Club taking part in any Competition Match and shall be at least equal to the minimum recommended cover determined from time to time by the Sanctioning Authority. In instances where The FA is the Sanctioning Authority, the minimum recommended cover will be the cover required by the Affiliated Association to which a Club affiliates. Any registration form which is sent by either of the means set out at Rules 18(A) (i) (a) or (b) above that is not fully and correctly completed will be returned to the Club unprocessed. If a Club attempts to register a player via WGS but does not fully and correctly complete the necessary information via WGS, the registration will not be processed. For Clubs registering Players under Rules 18 (A) (i) (a) or (b) registration forms will be provided in a format to be determined by the Competition. For Clubs registering Players via WGS (under Rule 18 (A) (i) (c)) Clubs must access WGS in order to complete the registration process. (ii) Registration forms may also be submitted to the (Registrations) Secretary by electronic mail or facsimile machine prior to the Player playing in a Competition Match. The original document must be forwarded by post to the appropriate Officer of the Competition within three days of the Competition Match. The registration document must incorporate a copy of the player's birth certificate or proof of age. In cases where the birth certificate is not available a Competition is required to accept a photocopy of the payer's passport or other official document issued by a Government Agency attesting to the Player seeking registration date of birth together with confirmation that the Player's proof of date of birth has been checked by the Club and is accurate. The player must also be registered on the League Website. (ii) A Player registered with a Premier League or English Football League Academy under the Elite Player Performance Plan contained within Youth Development Rules will not be permitted to play in this Competition. Details of the Youth Development Rules are published on The FA website. A Player registered with a FA Girls' Regional Talent Club may play in this Competition subject to the FA Programme for Excellence (Female) Regulations. (i) A Player shall not be permitted to register for more than one Club subject to the exceptions set out in Rule 18 (E)(iii) below. (ii) The Management Committee shall have power to refuse, cancel or suspend the registration of any Player, the exercise of such power being without prejudice to the Management Committee's ability to fine a Club at its discretion (in accordance with the Fines Tariff) that has been charged and found guilty of registration irregularities(subject to Rule 7). (H) Subject to compliance with FA Rule C2(a) when a Club wishes to register a player who is already registered with another club it shall submit a transfer form (in a format as determined by the Competition) to the Competition accompanied by a fee as set out in the Fees Tariff. Such transfer shall be referred by the Competition to the club for which the player is registered. Should this club object to the transfer it should state its objections in writing to the Competition and to the player concerned within 3 days of receipt of the notification. Upon receipt of the Club's consent, or upon its failure to give written objection within 3 days, the Secretary may, on behalf of the Management Committee, transfer the player who shall be deemed eligible to play for the new Club from such date or [7 ] days after receipt of such transfer. (I) A Player may not be registered for a Club nor transferred to another Club in the Competition after 31st March except by special permission of the Management Committee. A Player is not entitled to more than 2 (Two) transfers in anyone Season .All Kit / equipment/ fines and monies owing to the Club must be returned / paid before a transfer is accepted by the League. T Transfer Forms shall be obtained from the League Website. In the event a Club has more than one Team in an age group, each Team must be clearly identifiable but not designated 'A' or 'B' or 1st or 2nd. In such cases, Players will be registered for one Team only. A Player so registered will be allowed to play for his Club in a younger or older age group within the provisions of Rule 18(C). (K) A register containing the names of all Players registered for each Club, with the date of registration, shall be kept by the Registrations Secretary and shall be open to the inspection of an Officer of the Club at all Management Committee meetings or at other times mutually arranged. Registrations are valid for one Playing Season only. (L) A Player shall not be eligible to play for a Team in any special championship, promotion or relegation deciding Competition Match (as specified in Rule 22(A)) unless the Player has played [3 ] Competition Matches for that Team in the current Playing Season. (N) (i) Subject to Rule 18(N)(ii), any Club found to have played an ineligible Player in a Competition Match or Matches where points are awarded shall have the points gained from that Competition Match deducted from its record, up to a maximum of 12 points, and have levied upon it a fine in accordance with the Fines Tariff. (c) Order that such Competition Match or Matches be replayed (on such terms as are decided by the Management Committee). (O) (i) Priority must be given at all times to school and school organisations activities. Failure to comply with this Rule will result in a fine in accordance with the Fines Tariff. 19. Every Club must register the colour of its shirts and shorts with the Secretary by the Fixture Meeting who shall decide as to their suitability. Any Team not being able to play in its normal colours as registered with the Competition shall notify its opponents the colours in which they will play (including the colours of the goalkeeper jersey) at least [7 ] days before the Competition Match. If, in the opinion of the referee, two Teams have the same or similar colours, the away Team shall make the change. Should a Team delay the scheduled time of kick-off for a Competition Match by not having a change of colours they will be fined in accordance with the Fines Tariff. 20. (A) All Competition Matches shall be played in accordance with the Laws of the Game as determined by the International Football Association Board or, for Mini-Soccer, and 9v9 football, the Rules as set down by The FA. The Management Committee shall have power to decide whether a pitch and/or facilities are suitable for Competition Matches and to order the Club concerned to play its Competition Matches on another ground. Football Turf Pitches (3G) are allowed in this Competition provided they meet the required performance standards and are listed on the FA's Register of Football Turf Pitches. All Football Turf Pitches used must be tested (by a FIFA accredited test institute) every three years and the results passed to The FA. The FA will give a decision on the suitability for use and add the pitch to the Register. The times of kick-off shall be entered on the Website 2 weeks before the scheduled Fixture is to be played. The away Team shall seek and acknowledge such particulars. Failure to comply with the Rule will result in a Fine. The home Team must provide goal nets, corner flags and at least two footballs fit for play and the referee shall make a report to the Competition if the footballs are unsuitable. Failure to comply with this Rule will result in a fine in accordance with the Fines . In the case of a revised fixture date, the Clubs must be given by the Competition 5 clear days' notice of the Competition Match (unless otherwise mutually agreed). (C) An Officer of the home Club must give notice of full particulars of the location of, and access to, the Ground and time of kick-off to the Match Officials and an Officer of the opposing Club at least [7 ] clear days prior to the playing of the Competition Match. If not so provided, the away Club shall seek such details and report the circumstances to the Competition. Failure to comply with this Rule will result in a fine in accordance with the Fines Tariff. (E) (i) In competitions where points are awarded, home and away matches shall be played. In the event of a Club failing to keep its engagement the Management Committee shall have the power to impose a fine (in accordance with the Fines Tariff), deduct points from the defaulting Club, award the points from the Competition Match in question to the opponents, order the defaulting Club to pay any reasonable expenses incurred by the opponents or otherwise deal with them except the award of goals. Notwithstanding the foregoing home and away provision, the Management Committee shall have power to order a Competition Match to be played on a neutral ground or on the opponent's Ground if they are satisfied that such action is warranted by the circumstances. (ii) Any Club unable to fulfill a Fixture or where a Competition Match has been postponed for any reason must, without delay, give notice to the Fixtures Secretary who will give permission or not to ask the Manager of the opposing Club to agree to a postponement. The Match Officials must be contacted by the home team and confirmation sought. Only the Fixtures Secretary responsible for the League in question may approve any changes to the scheduled Fixtures for whatever reason. Any changes to a Fixture, made without the prior approval of the Fixture Secretary will be regarded as an "unauthorized postponement" and both Clubs will be liable to a summary penalty of £10. . When a match has been postponed (for whatever reason) both Teams must submit a fully completed postponement notification in the prescribed manner. All matches must be played on the Dates, scheduled by the League, but priority will be given to Schools, the Football Association and all relevant County Association Cup competitions. Cup Matches will take priority over League matches unless the relevant Fixture Secretary feels it is to the benefit of the competition to play a League game. Allowed for in these Rules. (iii) In the event of a Competition Match not being played or abandoned owing to causes over which neither Club has control, it should be played in its entirety on a date to be mutually agreed by the two Clubs and approved by the Management Committee. Failing such agreement and notification to the (Fixtures) Secretary within  day the Management Committee shall have the power to order the Competition Match to be played on a named date or on or before a given date. Where it is to the advantage of the Competition and the Clubs involved agree, the Management Committee shall also be empowered to order the score at the time of an abandonment to stand. Failure to comply with this Rule will result in a fine in accordance with the Fines Tariff. Team or its Club member(s) they shall be empowered to award the points for the Competition Match to the opponent. and shall not be replayed. For Under 11s - Under 18s – A Club may use up to [5 from 5 substitute Players] A Player who has been substituted becomes a substitute and may replace any Player at any time subject to the substitution being carried out in accordance with Law 3 of the Laws of Association Football. In Youth Football only, the referee shall be informed of the names of the substitute Players not later than [5 ] minutes before the start of the Competition Match and a Player not so named may not take part in that Competition Match. A Player who has named as a substitute before the start of that Competition Match but does not actually play in the game shall not be considered to have been a Player in that Competition Match within the meaning of Rule 18 of this Competition. (G) The half time interval shall be of [5 ] minutes' duration, but it shall not exceed 15 minutes. The half time interval may only be altered with the consent of the referee. (I) Games shall not kick off before 9am or after 14:30pm except with permission of the relevant Fixture Secretary. Three separate teams will be asked to submit a written explanation of the marks to the League Secretary and may be dealt with by the League Management Committee. An online form will be provided for the use of these identified persons Failure to provide marks will result in a fine for the Team (in accordance with the Fine Tariff). (K) All Teams must provide a standard First Aid to be made available when competing in any Jack Kalson Fixture. 21. (A) The Fixtures Secretary must receive within [1 ] day of the date played, from both Teams, the result of each Competition Match in the prescribed manner. This must include the forename(s) and surname of the Team Players (in block letters) and also the referee markings required by Rule 23, or any other information required by the Competition. Failure to comply with this Rule will result in a fine in accordance with the Fines Tariff. (B) The Fixtures Secretary must receive within  day of the date postponed, from both Teams, confirmation of the postponement of each Competition Match in the prescribed manner. This must include the Fixture Date, Home and Away Teams "P" in the goals column and the reason for postponing in the notes section on the result notification. Failure to comply with this Rule will result in a fine in accordance with the Fines Tariff. (D) The Competition and Clubs are permitted to collect but NOT publish results or any grading tables for fixtures involving Under 11s. Any Competition failing to abide by this Rule will be dealt with by the Sanctioning Authority, and any Club failing to abide by this Rule will be fined in accordance with the Fines Tariff. The Competition and Clubs are permitted to collect and publish results for trophy events. 22. (A) In Competitions where points are awarded, Team rankings within the Competition will be decided by points with three points to be awarded for a win and one point for a drawn Competition Match. The Teams gaining the highest number of points in their respective divisions at the end of the Playing Season shall be adjudged the winners. Competition Matches must not be played for double points. each division except as provided for hereunder, subject to the provisions of Rule 2(L). Match Officials will be paid their fees and/or expenses by the home Club before/immediately after the Competition Match, unless otherwise ordered by the Management Committee. Failure to comply with this Rule will result in a fine in accordance with the Fines Tariff. (F) In the event of a Competition Match not being played because of circumstances over which the Clubs have no control, the Match Officials, if present, shall be entitled to half fee plus expenses. Where a Competition Match is not played owing to one Club being in default, that Club shall be ordered to pay the Match Officials, if they attend the Ground, half fee plus expenses. Failure to comply with this Rule will result in a fine in accordance with the Fines Tariff. 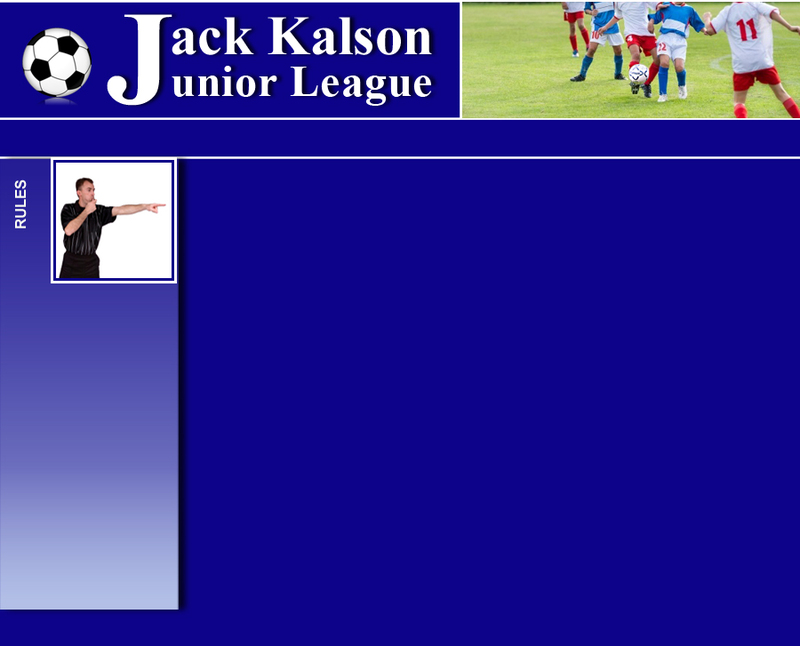 RULES-DIVISIONAL CUP COMPETITIONS U11/12/13/14/15/16/17 YRS IN CONJUNCTION WITH LEAGUE CODE "B"
These Competitions shall be called the JACK KALSON JUNIOR LEAGUE DIVISIONAL TROPHY'S at the age groups of UNDER 11yrs / UNDER 12yrs / UNDER 13yrs / UNDER 14yrs / UNDER 15yrs / UNDER 16yrs / UNDER 17yrs. All six Competitions shall be conducted on the knockout system. All matches shall be played and carried out in accordance with the Rules, Regulations and Bye-laws of the Football Association and the Laws of the game. a) Each Cup / Trophy shall be open for annual competition amongst affiliated Clubs that are members of the Competition stated in Rule1 as the Management Committee may from time to time decide. b) The entry fee shall be Ten pounds (£10.00) per Team payable on or before the Fixture Meeting in each year. b) The Officers of the Competition shall be the same as those elected at the Annual General Meeting of the Jack Kalson Scunthorpe and District Junior Leagues Competition. c) Any suggested alterations to these rules may be made but they must have been submitted, in writing, to the Competition Secretary before 1st May in each year and signed by both the Chairman and Secretary of the Club proposing such alterations. Football Association Ltd. shall have been obtained. The entire control of the Competitions shall be in the hands of the Management Committee of the Jack Kalson Scunthorpe and District Junior Leagues Competition. In all rounds up to the Final the home Team shall take its own receipts and pay for any expenses occurred including ground preparation and Referees and Assistant Referees (where appointed) fees and expenses. The visiting Team is responsible for its own travelling expenses. The home Team shall also pay the official(s) his/their fee(s) and any expenses on the day of the match within a reasonable time after the conclusion of the match. a) The arrangements for all Finals shall be left entirely in the hands of the Management Committee who shall appoint dates and times, and times, appoint officials, arrange grounds, take all receipts and pay any expenses not to exceed a sum considered reasonable by the Committee. b) All Clubs in the Competitions shall be liable to make their ground available to the Competition for the purpose of the playing of the Final ties. c) Referees and Assistant Referees shall receive trophies/mementoes in lieu of a fee plus travelling expenses for the Final. d) The net proceeds of the Final of the Competition each year shall be devoted to the funds of that Competition. a) The duration of each game shall be ninety minutes (90) at under 17yrs, and eighty minutes (80) at under 16yrs and under 15yrs levels, seventy minutes (70) at under 14yrs and under 13yrs levels, and sixty minutes (60) at under 12yrs and 11yrs level, unless a shorter time of thirty minutes (30) each way of equal halves is mutually agreed by the two opposing captains in consultation with the Referee prior to commencement of the match. b) If in the opinion of the Referee two Teams have the same, or similar, colours the away Team shall change. Goalkeepers must wear colours which distinguish them from other players and the Referee. c) In all matches player's shirts shall be clearly numbered or a fine of five pounds (£5.00) will be imposed. d) Goal nets must be provided in all matches. a) No player shall play for more than one competing Club or Team in the same season. Each individual must have been a registered League Competition player of the Club or Team for which he happens to compete at least seven (7) clear calendar days previous to the registered date fixed for playing the match or seven (7) clear calendar days previous to the date on which the match is played whichever is the earlier. A player having played for a Club or Team in one match of the Competition for which he was qualified shall unless in the meantime has been transferred to another Club or Team shall be entitled to play in any subsequent match in the same Competition for the same Club or Team in the same season. In the case of postponed or replayed matches only those players shall be allowed to play who were eligible for the first match. A player who has been suspended may, if otherwise qualified, play in postponed matches after the term of his suspension has expired. Only players who were eligible to play in any round up to and including the semi - finals shall be allowed to play in the Final. b) Ineligible Player - Any Club or Team playing an ineligible player shall be struck out of the Competition and fined twenty five pounds (£25.00) per ineligible player. a) Referees shall. be appointed as directed by the Management Committee and in any match prior to the Final each Club shall appoint an efficient Assistant Referee or shall be fined twenty five pounds (£25.00). In cases of emergency League shall appoint a neutral Referee whom it considers will be suitable to the Clubs concerned. In the event the nonappearance of the appointed Referee the Clubs shall agree upon a neutral Referee. The Referee thus appointed shall, for that game, have the full powers, status and authority of a registered referee. b) Officials appointed under this rule shall be entitled to charge Referees fee of fifteen pounds (£15.00) / Assistant Referees fee of seven pounds fifty (£7.50). c) Referees / Assistant Referees in these Competitions shall wear black uniforms. d) Referees must order matches to commence at the appointed time wherever possible and must report all late starts to the Management Committee of the Competition advising both captains of his intentions. e) Referees must report, in writing, the exact time of kick-off in cases of late starts and also any cases of matches not started or completed, stating clearly the reasons for this within three (3) clear days to the Competition Secretary. f) Any Club / Team giving a mark to a referee of (50) or less must submit a separate report giving the reasons within 5 days of the fixture taking place. Clubs failing to comply with this rule shall be liable to be fined or dealt with as the Management Committee determine. Any objections relative to the field of play or appurtenances of the game must be lodged with the Referee before the commencement of the match. All protests or Objections must be made, in duplicate, and confirmed, in writing, to the Competition Secretary within three (3) clear days after the match accompanied by a protest fee of ten pounds (£10.00) which shall be forfeited if the protest / objection fails. a) Dates shall be appointed by the Management Committee for each round of the Competitions at the Annual General Meeting or Fixture Meeting and immediately made known to the Secretary of the Lincolnshire Football Association Ltd. And all matches must be decided on or before the dates so chosen unless the special permission of the Management Committee be obtained for an extension of time. Clubs first drawn in the ballot shall have choice of ground. b) In the event of a match not being played or abandoned owing to causes over which neither Club has control it shall, subject to Rule 7(B) be replayed in its entirety on a date to be mutually agreed by the two Clubs concerned and approved by the Management Committee. Failing such agreement the Management Committee shall have power to order the match to be played on, or before, a specified date. c) Cup ties shall be played on appointed dates, in the event of a club failing to keep its cup appointment the management committee shall have the power to inflict a fine of £20.00 and award the cup tie to their opponents and order the defaulting club to pay any expenses incurred by their opponents or otherwise deal with them. d) Kick off times must be entered on the leagues website a minimum of TWO weeks before all scheduled league and cup fixtures. Failure to do so will result in a fine of £20.00 being imposed. The away club shall seek and acknowledge such particulars. a) The Fixture Secretary must receive, from both teams, within 1(One) Day, of the date played, the result of each Competition match in the prescribed manner. This must include the forename(s) and surname of the team players and the substitutes and also the Referee markings required by Rule 23, or any other information required by the Competition. Failure to do so will incur a fine of £20.00 for each offence and/or the club/team being dealt with as the Management Committee may decide. b) The fixture secretary must receive within 1 (One) Day, of the date postponed, from both teams, confirmation of the postponement of each competition match in the prescribed manner. This must include the fixture date, the home and away teams, "P" in the goal columns, and the reason for the postponing in the notes section on the match result notification. Failure to do so will incur a fine of £20.00. The fixture secretary shall, within 21 days, schedule a new fixture date for postponed/cancelled matches. a) Any Club reaching the Semi - Final or Final stage of the Competition shall not be allowed to withdraw or postpone such match, but must play its best available Team. In the event of any Club failing to keep its engagement without making application for postponement or giving a satisfactory explanation to the Management Committee the match shall go against it by default and a fine of fifty pounds (£50.00) shall be imposed. b) In the event of an abandoned game no Club shall be allowed subsequently to withdraw except by permission of the Management Committee. Any Club not complying with this rule shall be considered to be guilty of misconduct and in addition to being dealt with by the Management Committee shall be required to pay any reasonable expenses of their opponents. a) In the event of the match being a draw at full time (both Teams having the same number of goals scored) extra time shall be played of fifteen minutes (15) each way at under 17yrs, ten minutes (10) each way at under 16yrs, under 15yrs and under 14yrs, five minutes (5) each way at under 13yrs, under 12yrs and under 11yrs, in all rounds of the Competitions up to and including the Final. If the result is still a draw after extra time has been played then the match shall be decided upon by taking of kicks from the penalty mark in accordance with instructions in the Football Association handbook. a) The Management Committee shall have power for breach of rules or other misconduct to inflict fines upon Clubs, to suspend or expel any player or Club from taking part in the Competitions, and to order matches to be replayed on such terms and conditions as they decide. Sub-Committee and shall have power to appoint Commissions to inquire into any complaints, claims, appeals, protests, or any other matters within the jurisdiction of the Competitions and the expenses of such Commissions shall be borne by the party (or parties) to whom the Commission has deemed to have been at fault. Subject to confirmation by the Management Committee the decisions of any Sub-Committee or Commissions shall be considered final subject to Rule 14.
a) A Competition Cup or Trophy shall be vested in the Association sanctioning the said Competition as Trustees. If a Competition be discontinued for any cause, the Cup or Trophy shall be returned to the Donor I Sponsor, if the conditions attached to it so provides or otherwise dealt with as the Association may decide. when called for by the Management Committee, and for its keeping in the meanwhile. Such Cup or Trophy must be returned in the condition it was presented to the Club or a fine of twenty pounds (£20.00) will be imposed. If the Cup or Trophy is lost or damaged while under our care we agree to refund to the Competition the amount of its current value or cost of its complete and thorough repair. c) At the close of each Competition awards may be made to the winners I runners-up if the funds of the Competition permit. The presentation of any other mementoes or souvenirs is not allowed unless permission has previously been obtained from the Management Committee. The Lincolnshire Football Association Ltd. Competitions shall take preference over any fixtures arranged under the rules of these Competitions. Within fourteen days (14) of the posting of written notification of any decision of the Management Committee of the Competitions, a Club, Official or player against whom action is being taken may appeal against such decision by lodging particulars, in duplicate, with the Secretary of the Lincolnshire Football Association Ltd. Including a fee of thirty-five pounds (£35.00) for adjudication by a Board of Appeal. The grounds of appeal shall be in accordance with FA Rules. The Board of Appeal may order the appeal fee to be forfeited and shall decide by whom the cost of the appeal shall be borne. The decision of the Board of Appeal is final and binding on all parties concerned. A Club, having been granted permission by the Lincolnshire Football Association Ltd, to enter any Competition outside of the County, is not subsequently allowed to postpone or cancel any match within the jurisdiction of the Lincolnshire Football Association Ltd. without first gaining their permission. Each Club shall be deemed to have given its assent to the foregoing Rules and agreed to abide by the decisions of the Management Committee subject to Rule 18. Each Club in the Competitions must be supplied with a complete copy of the respective Competition Rules. All amendments of Rules can only be implemented once approved by the appropriate sanctioning authority. A team at its discretion and in accordance with new FA laws of the game use up to 5 (five) substitute players in this Competition. A player who has been substituted himself becomes a substitute and may replace another player at any time subject to the substitution being carried out in accordance with new FA laws. The Referee shall be informed of the names of the substitutes before the start of the match. a) If the fine or penalty is not paid by the next Management Meeting the offending Club to be fined a further twenty (£20.00) pounds. b) Any Club which has not paid outstanding fines by the Annual General Meeting in each year shall not be eligible for membership for the following season. RULES - CHALLENGE CUP COMPETITIONS IN CONJUNCTION WITH LEAGUE CODE "B"
RULES- CHALLENGE CUP COMPETITIONS IN CONJUNCTION WITH LEAGUE CODE "B"
These Competitions shall be called the JACK KALSON SCUNTHORPE AND DISTRICT JUNIOR LEAGUES Presidents Cup (for Under 12yrs), McDonalds Challenge Cup (for Under 14yrs) and David Darby Trophy (for Under 16yrs). All three Competitions shall be conducted on the knock-out system. All matches shall be played and carried out in accordance with the Rules, Regulations and Bye-laws of the Football Association and the Laws of the game. a) The Cup I Trophy shall be open for annual competition amongst affiliated Clubs that are members of the Competition stated in Rule 1. as the Management Committee may from time to time decide. b) The entry fee shall be Ten pounds (£10.00) per Team payable on or before the Fixture Meeting in each year. Teams must make application to enter if they wish to take part in the appropriate Competition. d) Any alterations, or additions, decided upon shall not become operative until the approval of the Lincolnshire Football Association Ltd shall have been obtained. a) The arrangements for all Finals shall be left entirely in the hands of the Management Committee who shall appoint dates and times, appoint officials, arrange grounds, take all receipts and pay any expenses not to exceed a sum considered reasonable by the Committee. c) The net proceeds of the Final of the Competition each year shall be devoted to the funds of that Competition. d) Referees and Assistant Referees shall receive trophies / mementos in lieu of a fee plus travelling expenses for the Finals. a) The duration of each game shall be eighty minutes (80) at under 16yrs level, seventy minutes (70) at under 14yrs level and sixty minute (60) at under 12yrs level unless a shorter time of thirty minutes (30) each way of equal halves is mutually agreed by the two opposing captains in consultation with the Referee prior to commencement of the match. c) In all matches players' shirts shall be clearly numbered or a fine of five pounds (£5.00) will be imposed. the semi - finals shall be allowed to play in the Final. b) Ineligible Player - Any Club or Team playing an ineligible player shall be struck out of the Competition and fined twenty five pounds (25.00) per ineligible player. c) To play in the Presidents Cup the player must have attained the age of ten years (10) but must be under the age of twelve years (12) as at midnight on 31st August in the playing season. d) To play in the McDonalds Challenge Cup the player must have attained the age of twelve years (12) but must be under the age of fourteen years (14) as at midnight on 31st August in the playing season. a) Referees shall be appointed as directed by the Management Committee and in any match prior to the Final each Club shall appoint an efficient Assistant Referee or shall be fined twenty five pounds (£25.00). In cases of emergency the League shall appoint a neutral Referee whom it considers will be suitable to the Clubs concerned. In the event of the non-appearance of the appointed Referee the Clubs shall agree upon a neutral Referee. If a neutral referee is not available teams shall agree to either the home side providing a referee or the away side providing a referee. The Referee thus appointed shall, for that game, have the full powers, status and authority of a registered referee. d) Referees must order matches to commence at the appointed time and must report all late starts to the Management Committee of the Competition advising both captains of his intentions. e) Referees must report, in writing, the exact time of kick-off in cases of late starts and also any cases of matches not started or completed, stating clearly the reasons for this within three (3) clear days to the League Secretary. f) Any Club giving a mark to a referee of Fifty (50) or less must submit a separate report giving the reasons within 5 days of the fixture taking place. Clubs failing to comply with this rule shall be liable to be fined or dealt with as the Management Committee determine. Any Objections relative to the field of play or appurtenances of the game must be lodged with the Referee before the Commencement of the match. All protests or objections must be made, in duplicate, and confirmed, in writing, to the League Secretary within three (3) clear days after the match accompanied by a protest fee of ten pounds (£10.00) which shall be forfeited if the protest or objection fails. a) Dates shall be appointed by the Management Committee for each round of the Competitions at the Annual General Meeting and immediately made known to the Secretary of the Lincolnshire Football Association Ltd. And all matches must be decided on or before the dates so chosen unless the special permission of the Management Committee be obtained for an extension of time. Clubs first drawn in the ballot shall have choice of ground. c) Cup ties shall be played on appointed dates, in the event of a club failing to keep its cup appointment the management committee shall have the power to inflict a fine of £20.00 and award the cup tie to their opponents, and order the defaulting club to pay any expenses incurred by their opponents or otherwise deal with them. d) Kick off times must be entered on the leagues website a minimum of TWO weeks (2) before all scheduled league and cup fixtures. Failure to do so will result in a fine of £20.00 being imposed. The away club shall seek and acknowledge such particulars. a) The Fixture Secretary must receive, from both teams, within One (1) Day, of the date played, the result of each Competition match in the prescribed manner. This must include the forename(s) and surname of the team players and the substitutes and also the Referee markings required by Rule 23, or any other information required by the Competition. Failure to do so will incur a fine of £20.00 for each offence and/or the club/team being dealt with as the Management Committee may decide. b) The fixture secretary must receive within One (1) Day, of the date postponed, from both teams, confirmation of the postponement of each competition match in the prescribed manner. This must include the fixture date, the home and away teams, "P" in the goal columns, and the reason for the postponing in the notes section on the match result notification. Failure to do so will incur a fine of £20.00. The fixture secretary shall, within 21 days, schedule a new fixture date for postponed/cancelled matches. a) Any Club reaching the Semi - Final or Final stage of the Competition shall not be allowed to withdraw or postpone such match, but must play its best available Team. In the event of any Club failing to keep its engagement without making application for postponement or giving a satisfactory explanation to the Management Committee the match shall go against it by default and a fine of (£50.00) shall be imposed. b) No Club shall be allowed to withdraw except by permission of the Management Committee: Any Club not complying with this rule shall be considered to be guilty of misconduct and in addition to being dealt with by the Management Committee shall be required to pay any reasonable expenses of their opponents. In the event of a draw at full time extra time of ten minutes (10) each way at under16yrs and under 14yrs level shall be played, and five minutes (5) each way at under12yrs, in all rounds up to and including the Final. If the result is still a draw after extra time has been played then the match shall be decided upon by the taking of kicks from the penalty mark in accordance with instructions in the Football Association handbook. Sub-Committee and shall have power to appoint Commissions to inquire into any complaints, claims, appeals, protests, or any other matters within the jurisdiction of the Competitions and the expenses of such Commissions shall be borne by the party (or parties) to whom the Commission shall deem to have been at fault. Subject to confirmation by the Management Committee the decisions of any Sub-Committee or Commissions shall be considered final subject to Rule 14.
a) A Competition Cup or Trophy shall be vested in the Association sanctioning the said Competition as Trustees. If a Competition be discontinued for any cause, the Cup or Trophy shall be returned to the Donor if the conditions attached to it so provides or otherwise dealt with as the Association may decide. We, A and B, the Chairman and Secretary of F.C. being members of and representing the Club having been declared the winner of the Cup / Trophy and it having been delivered to us by the Competition do hereby on behalf of the Club jointly and severally agree to return the Cup / Trophy to the League Secretary on or before 31st March in each playing year, or when called for by the Management Committee, and for its keeping in the meanwhile. Such Cup or Trophy must be returned in the condition it was presented to the Club or a fine of twenty pounds (£20.00) will be imposed. If the Cup or Trophy is lost or damaged while under our care we agree to refund to the Competition the amount of its current value or cost of its complete and thorough repair. A Club, having been granted permission by the Lincolnshire Football Association Ltd., to enter any Competition outside of the County, is not allowed to postpone or cancel any match within the jurisdiction of the Lincolnshire Football Association Ltd. without first gaining their permission. Management Committee, subject to Rule 18, each Club in the Competitions must be supplied with a complete copy of the Competition Rules. a) If the fine or penalty is still not paid by the next Management Meeting the offending Club to be fined a further twenty (£20.00) pounds.